Description: few dragoons + Zealots + carriers = win (OK maybe not versus BWAPI). Description: a Meching TvP AI. likes to expand quickly. 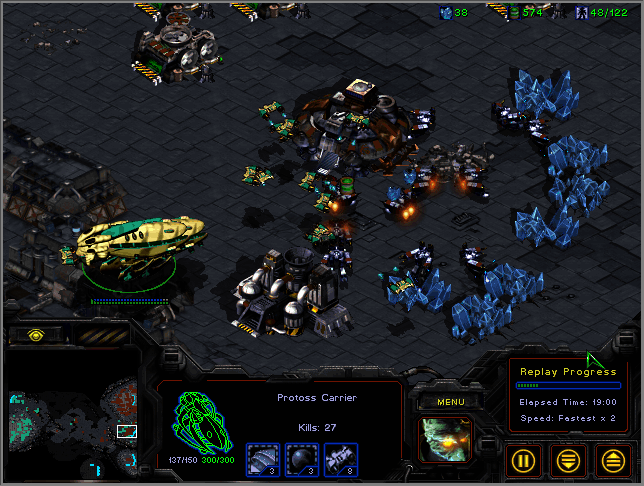 Description: a Meching TvP AI. The purpose of this thread is to explore the PvT AIvsAI matchup..and have fun! Last edited by psychowico on Sun Dec 30, 2012 11:11 pm, edited 2 times in total. Will have to add some zealots in to natural defences. I think adding more cannons doesn't work mostly because shots are wasted by overkilling a unit. Sometimes the AI still wins after it loses it's natural because it attacks with 1-2 Carriers and wins. Well actually it does pretty bad against mech, because it relies on cannons for defense, and a few siege tanks could easily wipe them out. And with mech you could get goliaths. The normal AI for Goliaths are pretty bad, they seem to walk around a lot without doing much. BWAPI goliaths probably don't have this problem. EDIT: Even defense against M+M is kinda faulty. Sometimes it works fine (Jade, Icarus), and sometimes it just fails (Byzantium). ??????????????????????? Maybe it just has to do with cannon targeting??? I'm kind of not sure if I want zealots to get speed, they seem to rush ahead of the carriers and suicide. This version gets armor upgrades for zealots eventually. It also has a timed expand loop, which fixes the random expanding the AI used to do. Should be macroing a bit better. In one of my test matches, it was a base trade scenario, with each AI having 1 base left, but then my AI tried to come back to defend it's base, but it was too late . If it would have gone for the last Terran base, it probably would have won. Does anybody have an unedited version of ZBwaiP v0.2? I got a bit careless with backing up copies, and so the version I have now actually doesn't work as well. The attachments are gone from the original site/forum, so can someone upload it and link? Taranok wrote: Does anybody have an unedited version of ZBwaiP v0.2? I got a bit careless with backing up copies, and so the version I have now actually doesn't work as well. The attachments are gone from the original site/forum, so can someone upload it and link? Can you post any version of it? I'd like to see this script in action. Was there another topic on the old boards where this might have been placed? I just looked at the most recent data backup of site, and it only goes back to Dec 21st 2012. The period between the 21st and the 28th (when this new board was installed) unfortunately was only backed up w/ posts not data. But will keep looking sorry. Also.. I know attachments aren't currently working and look ugly broken in posts, but they are still there and can be retrieved by their number very easily. So for now, keep any broken attachment links you feel are important for the time being. Yes, it's possible to find the attachment w/ just the topic i.d.#, but definitely not as easy. am currently working on a quick reformat of poiuy's PyMS pages/layout, but will address the old attachments soon after that. Sorry if this one slipped thru during the last week. Was there another topic on the old boards where this might have been placed? Is this the most recent update before you made this post? If so can retrieve that. [attachment=3119:ZBwaiP.txt] Which by chance happens to be the last saved attachment on the old boards. Nothing after that. Anyway, I think I worked out a semi-decent version that can win maybe about 60% versus the top T bots? Re: ZBwaiP v0.2b (Updated 1/1/13) Happy New Year! I, uhhh, think I broke the game? Well, Taranok, you were right about Carriers being good, especially with upgraded shields and plating. Sometimes they get caught out in the open, but it's not too weird to find some with 10 kills and even a few with 20 kills (that's 1000 minerals worth! ).